The most convenient way to filter your water is to simply install a filter on the end of your faucet. The best faucet water filters remove most common contaminants without costing you much money or causing you any inconvenience. Sadly, a lot of models are absolute nightmares to use. They leak, break, clog, or just plain don’t do the job properly. Don’t worry, though! In this guide, we’ll steer you to the most effective, reliable, and user-friendly water filters you can buy for your faucet. We’ve compared dozens of options to see which perform the best and last the longest. Find out which models we recommend below, and be sure to check out our handy buying advice to determine which is the best choice for you! 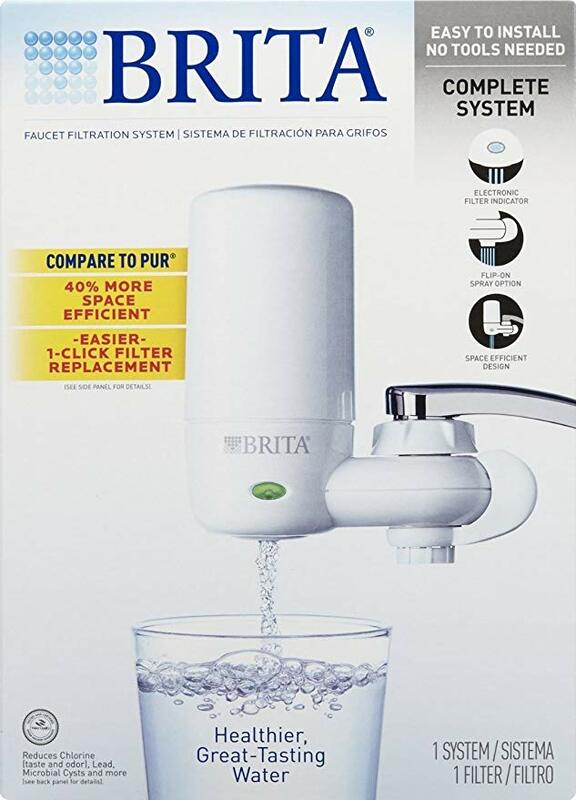 This faucet-mounted water filter from Brita is our recommendation to most buyers. It’s one of the more expensive options on the market, but it’s better-designed and better-made than the PUR system below or any of the other options we’ve reviewed to date. It’s a solid filtration system. Brita’s On-Tap cartridges remove all the key contaminants, including lead, benzene, chlorine, asbestos and more. All of those elements are reduced by 99%. That is to say, this is as effective as any painfully-slow filtration pitcher. Filters last 4 months, according to Brita, which is significantly longer than PUR or other companies. Even if you don’t quite get that long out of each one, you can still count on them to give you longer life than the alternatives. The housing includes a handy alert light which tells you when to replace the filter. We love that it measures flow rate as well as being a timer. Most other models are just timers that flash every few months, but this one will flash at either 100 gallons or 4 months–whichever comes first. It has adjustable flow settings. That’s a key difference between the Brita and competing models. You can switch this from filtered water to unfiltered water (if you want to water plants or something like that without wasting filter life), and you can also select an unfiltered spray mode for rinsing more effectively. Basically, the Brita is a lot better as an extension of your faucet than the competing options. It’s more compact than the PUR. That helps the Brita get out of your way as you use your sink. A lot of faucet-mounted options are massive and clunky, making life a hassle when you use them. This is certainly not tiny, but it does save noticeable space compared to the competition. It lasts longer than other faucet-mounted models. Both the filter housing unit and the actual filter cartridges themselves have significantly better longevity than PUR’s versions (or the other models we’ve reviewed to date. Of course, the housing is all still made of plastic, but it should last you longer than others. It’s more expensive than the PUR below, despite the fact that it filters the same things. The Brita doesn’t come with as many start filters, either. The filters are more expensive to replace, too. Granted, they do last longer, but your results may vary. These Brita replacement filters are what you’ll want to stock up on if you choose to go with the Brita on-tap unit we’ve recommended above. Just as that model is our recommendation to anyone who can spend a little more money up front, we think these are the best filter cartridges you can use on your tap. That’s if you’re ok with paying a bit more up front for long-term performance, that is. They filter as well as any of the competition, and end up giving you longer working lives with each cartridge. They filter extensively, considering how quickly and conveniently they work. As we mentioned in our review of the whole setup above, Brita’s filters remove 99% of lead, chlorine, and other common contaminants. They also eliminate all but .01% of cryptosporidium and giardia! That’s as effective as anything short of reverse osmosis. These cartridges last noticeably longer than PUR’s. They’re rated for the same amount of water, but we’ve found that PUR ones need to be replaced sooner than recommended while these can always be effective for the full period. Brita’s latest versions (which we’re recommending here) are tested and approved by the WQA (Water Quality Association). The older cartridges technically removed the same things, but they were only tested by Brita themselves. We still found they did excellent jobs, but having third-party certification makes these ones much more reassuring to the critical consumer. As we mentioned above, Brita’s replacement filters tend to be 25-50% more expensive than the PUR equivalents. Depending on your home water quality, you may or may not see the difference made up in longevity. We think that in most cases, the Brita filters do tend to justify their higher price tag with long lives. That may not be the case for everybody, though. They’re not super easy to come across. PUR filters are always in stock, whereas these come and go. You’ll want to stock up on a few packs at a time. This PUR Advanced model is our alternative to the Brita for budget-minded folks, anyone who wants something more visually classy, and anyone who’s having trouble finding the Brita in stock. It filters just as effectively, and is significantly cheaper and easier to find. The PUR system filters just as well as the Brita. They filter all the same contaminants, and to the same extent. Considering that the initial cost of the kit and the long-term expense of replacing the PUR filters are both considerably cheaper, that’s extremely impressive. You don’t have to take PUR’s claims on their own merit, either. Just like the Brita, this one’s certified by the WQA. While the PUR fixture has a simpler design than the Brita, it does the same basic thing: filter water in real time as it comes through your faucet. There aren’t any different settings to choose from here, but that’s just as well given how cheap the plastic is. The PUR doesn’t try to do any more than it’s actually built to, which is refreshing compared to a lot of the competition. Despite the fact that this one has a poorer reputation for reliability than the Brita, it’s covered by the same 1-year warranty. So, you’re still guaranteed at least a year out of each one you buy. This is one of the best faucet-mount units on the market, but the build quality is still pretty disappointing. We’ve found that it usually fails somewhat faster than the Brita’s. However, it’s still better than anything else on the market. Likewise, the filter cartridges don’t last as long as Brita’s. They should probably be replaced more often than recommended by PUR. While the LED indicator light on the Brita setup above tracks actual flow as well as time, the PUR’s is simply a timer. That’s unfortunate, since it doesn’t give you as accurate a read on the filter’s lifespan. This PUR filter cartridge set is our suggestion for keeping the above fixture up and running well. It’s a 2-pack of the same cartridges that are included with the Advanced set. They’re much more affordable than the Brita ones. You can expect to find each PUR cartridge for as much as 50% less than the Brita equivalents. As we’ve said above, the lower price doesn’t mean reduced performance. 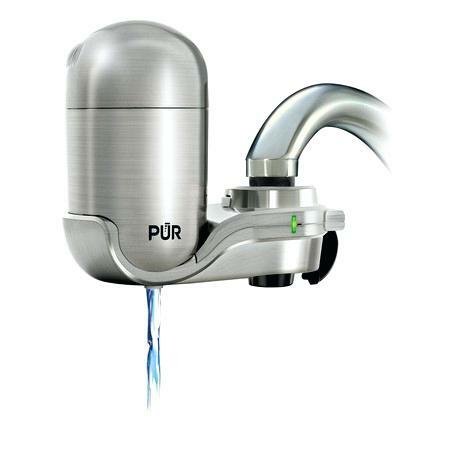 The PUR cartridges filter just as much as the Brita ones, and to the same extent. There’s not much point buying lots of these in multipacks, since the filter housing probably won’t last much longer than a couple of cartridges. That makes it a bit harder to max out the value of bulk buying. Now that we’ve looked at all our faucet-mounted recommendations, which water filter should you actually buy? The Brita system is the best overall, in our opinion, so we recommend it to anyone who can afford it. It’s pricier than the PUR and other comparable setups, but it has the best design and lasts the longest. However, it’s not always readily available, and the build quality isn’t radically better than the cheaper options. For replacements, we recommend Brita’s standard On-Tap replacement filters. They come in convenient packs, and work perfectly with the filter housing we’ve recommended in this guide. The PUR Advanced is our recommendation to anyone who wants to save some money over the Brita, or for anyone who finds that the Brita isn’t in stock when they read this guide. This one is much easier to get ahold of, and it does just as good a job filtering water. However, it doesn’t tend to last as long, and we miss the Brita’s bypass feature for saving filter life. Finally, if you need replacement filters for the PUR, we suggest the PUR RF-3375-2. It’s the best they offer right now. Plus, they’re significantly cheaper than the Brita equivalents! Faucet-mounted water filters can cost anywhere from $10 to $50+ for a filter housing unit and a starter filter or two. That’s not a huge range, but considering that these things only last a year or two on average, the differences can add up over time. The same is true of filter replacements. They can cost anywhere from $10-$20 per unit. As you’re considering how much you want to spend, think of this as a subscription rather than a purchase. That’ll help you get a sense of the long-term costs involved. Make sure to check on filter lifespan, too, so you know how often you’ll need replacements! Faucet-mounted water filters promise a lot in terms of convenience and effectiveness–not to mention value. They definitely deliver on all three, but there are some serious caveats to be aware of. First, all these fixtures are made pretty much entirely from plastic. That’s nothing to worry about from a water quality standpoint, since the models we recommend are all BPA-free. However, that does mean that when they break (and they do break), they’re disposable. You’re not going to be able to fix them, and cracks spread quickly. Secondly, they aren’t covered by long warranties. Some are covered for a year, while many others aren’t covered for any length of time at all. So, be aware that when one breaks, you’ll need to buy another. Thankfully, the extremely low prices of these gadgets means that it’s not the end of the world to have to replace them every year or so. They’re still considerably cheaper than countertop or under-sink systems. However, they’re definitely not long-term investments. We recommend them for folks who need something cheap and simple while they save up for a larger system. Thirdly, the filters rarely last as long as they’re supposed to. Plan on changing them about every month or so, assuming you have average water quality. Even though the filter housing won’t last forever, you can still stock up on filters! Whichever brand you choose, they’ll have a standard filter size that fits in all their models. We hope this guide has given you all the information you need to confidently choose your new faucet-mounted water filter. Learn more about any of the products featured in this guide by visiting the links in our reviews. You can also check out our other guides to water filters, if you want to see how these systems stack up to the under-sink options! Links to that guide and to all our other content are easy to find on our homepage, at kitchenfaucets.reviews!